This is an incredible simple painting, and is one even a child could do. The contrast of the gold against the burgundy is striking and the texture of the paper underneath is due to it being handmade. One thing I adored about Laos were the intricate murals inside the many Buddhist temples. 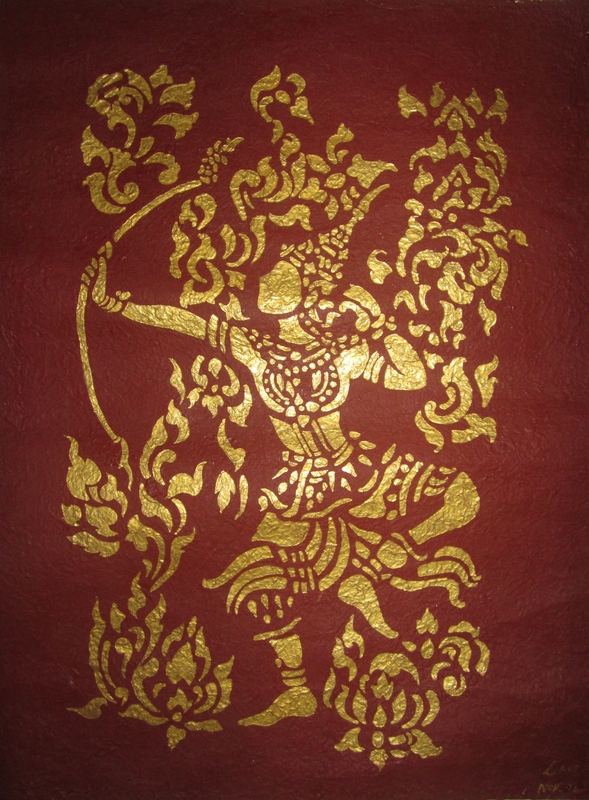 Entire stories were depicted inside temples through simple paintings of small gold figures on a dark background. The gold reflects the light, catching your eye and your attention. This painting is about 1 metre tall and survived the rest of my two months backpacking around South-East Asia wrapped up in a thin wicker tube. Isn’t the art striking? I recall seeing a little bookshop in Luang Prabang that offered a workshop on this traditional painting technique. I would’ve loved to have taken a class. Ooh I didn’t see the classes but I would have LOVED that. Next time! And were you given cylindrical cases made of straw ? I ended up having 4 or 5 of them full of tonnes of artwork by the end of my 4-month trip around Asia – althought the straw cases looked great I was never sure how much they’d protect the art in a squeeze! >This is an incredible simple painting, and is one even a child could do. The genius behind it is the process of deconstruction and simplification to make a seemingly impossible message becomes possible. Great observation! Like language, this artifacts speak volumes about their culture and their time. The preservation of this relic means the preciousness to their people. Where in Laos can we find this? What’s the name of the art work? This is from Luang Prabang and I just bought it off the street, hope you manage to find something similar next time you’re there.